Besides, India's trade deficit declined sharply to 38.1% to $7.67 billion in August 2016 from $12.39 billion in August 2015. Exports fell 0.3% to $21.52 billion in August 2016 over August 2015. Imports fell 14.09% to $29.19 billion in August 2016 over August 2015. Dipen Shah, Senior Vice President & Head PCG Research, Kotak Securities said, “Markets closed the week on a stronger note, amid supportive global markets and increased expectations that, the Fed rate hike will be postponed to December. The important triggers for the market in the next few weeks will be the Fed meeting scheduled for next week and the meeting of OPEC members in late September, which will likely discuss production cuts to stabilize crude prices." Globally, Asian stocks firmed on Friday after weak US data reduced already low expectations of an interest rate increase by the Federal Reserve next week, sending the Treasury yield curve surging to its steepest level in 2-1/2 months. MSCI's broadest index of Asia-Pacific shares outside Japan rose 0.4%, but was headed for a loss of 2.3% for the week. Japan's Nikkei extended gains to close 0.7% higher, but posted a weekly loss of 2.6% on worries about the course of action the Bank of Japan will take at its policy review on September 20-21. European stocks edged lower weighed by losses in the financial sector and as investors became more cautious ahead of the Federal Reserve's policy meeting next week. The Bank of England unanimously voted to leave interest rates unchanged at record low of 0.25% after a monetary policy review yesterday and hinted of a rate cut as soon as November, despite the Brexit bounce back. Back home, reports suggest that the Finance Minister Arun Jaitley is undertaking a quarterly performance review of state-run banks later today. Finance Minister Arun Jaitley on Friday expressed hope that the Reserve Bank will keep in mind the decline in retail inflation while deciding on interest rates at its policy review meeting on October 4. The rupee firmed up 16 paise to 66.86 against the dollar on fresh selling of the US currency by exporters and banks. Yesterday, the domestic unit had ended below the psychological 67-mark. 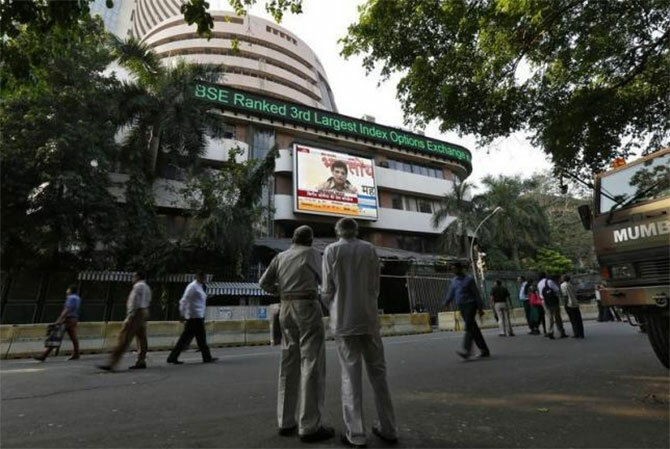 "We maintain our view to focus on global cues until next week and restrict your trades. At present, traders are facing major challenge due to excessive intraday volatility and we don't expect much relief in near future. Having said that, the downside seems capped in Nifty and possibility of resumption of uptrend is much higher post the prevailing pause" said Jayant Manglik, President, Retail Distribution, Religare Securities. Reliance Industries (RIL) was up 2.2% at Rs 1,089, extending its Thursday’s 2% gain on the BSE. The stock traded close to its 52-week high of Rs 1,090 touched on January 15, 2016 in intra-day trade. Global taxi aggregator Uber is teaming up with Maruti Suzuki to push up the number of drivers on its platform to over one million. Shares of Maruti Suzuki surged 2%. Infosys has informed BSE that the company has fixed October 24, 2016 as the Record Date for the purpose of payment of interim dividend. The stock surged over 1%. On the losing side, Tata Steel, Tata Motors, Asian Paints, ICICI Bank and Lupin slipped between 0.3%-2%. Debt-laden Tata Steel, this country’s largest in the sector, has indicated to UK trade unions that until the pension scheme issue there gets sorted, the company will not include the UK operations for sale discussion with Germany-based ThyssenKrupp. Private lender ICICI Bank reported a decline in advance tax outgo for the September quarter. It has paid Rs 1,200 crore, 20 per cent lower than the same period a year ago. The stock dipped marginally. Among other shares, Wockhardt gained around 8% after the media report suggests that US drug regulator has cleared the company’s Chikalthana plant. Suprajit Engineering rallied over 9%, extending its 5% gain in past three trading sessions, after the auto parts maker announced the acquisition of Wescon Controls, a US-based control cables maker, an enterprise value of $44.4 million (about Rs 295 crore). Shares of sugar companies ended higher by up to 8% on the bourses as sugar prices touched three-year highs due to strong demand from bulk consumers for the festive season amid millers selling at higher levels. Riga Sugar, Mawana Sugars, Dhampure Speciality Sugars, Dwarikesh Sugar Industries, Dharani Sugars, Simbhaoli Sugars, Thiru Arooran Sugars, Dhampur Sugar and Oudh Sugar were up between 2%-8%. Den Networks rose over 7.5% after the company said its board will meet on Tuesday, September 20 to consider a preferential issue to one of the leading global financial investors.